Crossed a street in Jakarta lately? It's impossible, isn't it? Everytime you cross the street, even at a zebra-cross, you pretty much roll your dice. Giving your guardian angel a hard time. Nobody bothers to slow down to give way to pedestrians. Even at pedestrian crossings, which are there to protect us mere mortals. Indcoup rightfully likened our traffic condition to a 'warzone' . It is, in a sense. 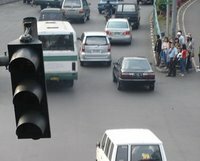 "Educated people should know that zebra-cross is there for pedestrians to cross the street safely. Pedestrians have equal rights. Who ever said that car drivers are higher-beings compared to pedestrians?" That after he got honked at by passing cars, when he crossed a street at a zebra-cross, in his university campus ! Looks like we are not THAT educated. Here pedestrians don't have equal rights. Once you step out of your car and turn into pedestrians, you instantly fall down to the bottom of the traffic food-chain. Why are we like this? Shouldn't we know better? 1. When you were small, what did you parents and teachers teach you about zebra-cross? 2. Who taught you to drive, and during your learning what did that person tell you about what to do when you approach pedestrian crossings? 1. We are told that pedestrians MUST cross the street at pedestrian-crossings. 2. We are told to always look left and right before we cross, and we have to wait until the street is clear before we can walk. 3. When learning to drive, we are told to watch for pedestrians. But almost none of us were told that when we drive, we MUST stop and give way at pedestrian crossings. Almost none of us were told that when we see pedestrians crossing the street, pedestrians have higher priority. We are shaped to think that by giving way to pedestrians we are being nice and doing them a favor. This is not right. We give way because we have to. Right now pedestrians are doing car drivers a favor by giving up their rights. There you go folks. Yes, we are not THAT educated. So we thought we should start educating our kids better about this whole crossing issue. And no education is better than continuously setting an example. So we will. (And for some of us who have drivers, we will start educating them as well. Put this as part of their 'performance appraisals' or something). So next time you drive and see a car stopping at zebra-cross and give way to pedestrians, please follow suit. You'll help making Jakarta a better place to live. And if for some craziest reason you don't feel like stopping, at least don't honk at those who do. i totally agree. though i hardly become a pedestrian since i'm in jakarta, i do feel that they are being ignored most of the times. those drivers are just too damn impatient when driving. but then again, i sometimes see pedestrians crossing the street in the middle of the junction, where it's very busy and there's no crossing. sometimes this action can make the traffic even worse. oh and another thing i notice.. there is not enough pedestrian crossing or crossing bridge for them to cross the streets.. especially in the wide streets... have you noticed? no wonder they ended up crossing anywhere. This is a kind of old and never end story in Indonesia. Both drivers and pedestrians sometime don't know their rights and obligations. And sadly, no initiative comes to solve this "easy but hard" problem step by step or frontally. Hi guys - I was in a bad mood when i wrote that piece - it was after the storms caused massive traffic jams in Jakarta. Hopefully development of the MTR will improve things. There is hope. And as you say - eduaction of kids at school on this would be a good thing. Having spent the last couple of years in New Haven, CT, U-S-of-A, I'd have to say that I feel safer crossing the street in Jakarta than I do here. You think being honked at by passing cars at a zebra cross is a big deal? Well, just yesterday I saw a lady at a zebra cross with a baby stroller being honked here. Here they treat pedestrians almost the same as in Jakarta, but then people drive two times faster. In their SUVs. Maybe Jakarta and New Haven should become sister cities. Guess Indonesians are in the same league with Roman and Parisian drivers in the this department! i drive scooter daily. i wish i could give all pedestrian to pass zebra cross at all time. but car/motorcycle traffic is dangerous. i must make sure my safety first and i don't get struct from behind, before i give pedestrian to cross the traffic. when i drive car, i certainly give pedestrian to cross road.